Whenever one talks of sustainable livelihoods, we look not only at the 5 types of assets of a community or individual, but also at their coping strategies. Thus vocational diversity in a farming family will cushion it against a bad crop or a natural disaster, or the sudden death of the principal breadwinner. At the national level, the coping mechanism is provided by the state in the form of social security nets like unemployment benefits, health care, free education, pensions or child benefits. 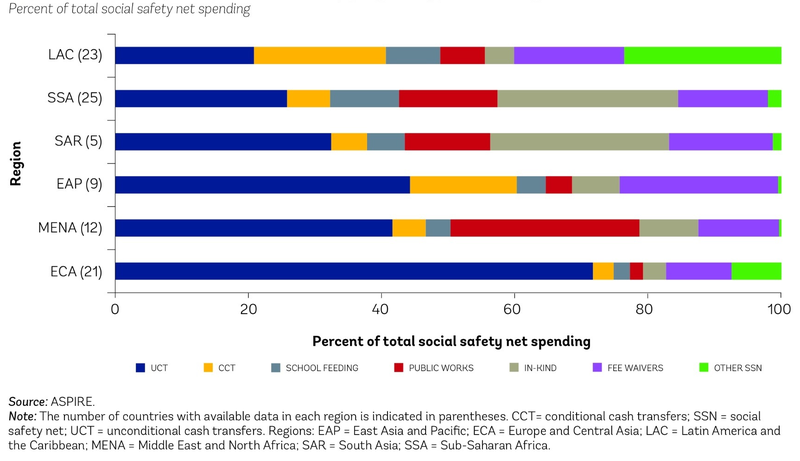 The portfolio of social safety net programmes is large and diverse. A developing country runs about 20 different safety net programmes, on average. Cash transfers and school feeding programmes are present in almost all countries. Cash transfers are becoming more popular and increasingly complex. Conditional cash transfer programmes are now present in 64 countries, a dramatic increase from 2 countries in 1997 and 27 countries in 2008. Worldwide, 1.9 billion people are enrolled in social safety net programmes. The world’s five largest social safety net programmes are all in middle-income countries and reach over 526 million people. However, the Report found that despite remarkable progress over the past 5 years, most of the poor remain outside the social safety net system, especially in low- and lower-middle-income countries, which have the lowest coverage levels of poor people in their societies, and the least ability to direct resources to those most in need. The coverage gap is particularly acute in Sub-Saharan Africa and South Asia, where most of the global poor live. In these regions, only one-tenth and one-fifth of the poorest 20 percent have access to social safety nets, respectively. Urban areas have serious gaps in coverage, at all income levels. While 285 million poor people live in cities in developing countries, reaching them presents special challenges, including identifying, targeting, communicating with, and enrolling perspective beneficiaries. In this writer’s own experience, the National Social Assistance Programme (which consisted of a nominal pension to the poor above the age of 65) showed very good results in rural areas, but was absent from the big metros, chiefly because the pension was disbursed through money orders, and the urban poor being homeless, simply did not have a postal address! Such procedural lapses are the chief cause that the social security coverage of the poorest in developing countries remains inadequate. Take the latest case of cheap loans for farmers, which have been cleverly diverted to non-farming uses. Firstly, as these loans use land as collateral, the poorest landless tenant farmers are not covered; and as the scrutiny before granting loans is cursory at best, a lot of these loans end up in Fixed Deposits earning the borrower anything from 8-9% interest, while he pays no more that 4% on his loan. The studies also delve deeper into the productive impacts of cash transfers, demonstrating how predictable cash transfers enhance households’ investment in activities to generate agricultural and nonagricultural income. In the urban context, a secure and predictable monthly income can mean the difference between shelter and homelessness, between education and illiteracy, between health and illness. Cash transfers also have major positive spillover effects on the local economy of target communities, especially in urban areas. Sadly, India is now ignoring all these benefits and the new government has ruthlessly slashed social expenditure in its last budget. What is frightening is that the eternal chase for higher growth rates (with a matching aversion to any form of subsidies and direct cash transfers, which are now being replaced by contributory insurance schemes), may rapidly undo all the gains in the areas of social security, social welfare and food security made by India as part of its commitment to the global social agenda, and the Millennium Development Goals. Next Post Business as usual – and damn the environment!